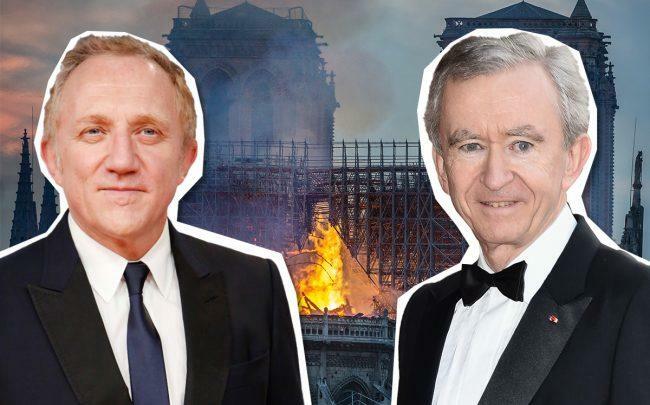 A pair of French billionaires are among those who are pledging hundreds of millions of euros to rebuild the fire-ravaged Notre-Dame Cathedral in Paris. Bernard Arnault, chairman and chief executive of LVMH Moët Hennessy Louis Vuitton SE – a major investor in Miami’s Design District – said his family and the luxury-goods company it controls would donate 200 million euros, or the equivalent of about $226 million, while billionaire François-Henri Pinault said his family would donate 100 million to the rebuild, according to the Wall Street Journal. Pinault is chairman and chief executive of Kering SA, a rival to LVMH. Total SA, a French oil and gas company, plans to give 100 million euros. Martin Bouygues, chairman and chief executive of Bouygues, a telecommunications company, said he and his brother will each donate about 10 million euros. A fire broke out on Monday afternoon at the more than 850-year-old cathedral, destroying most of the roof and central spire. French authorities were still investigating what caused the fire, although it was likely related to the construction surrounding the historic building’s renovations. It’s unknown how much the rebuild will cost in terms of money or time, but Peter Aiers, chief executive of the Churches Conservation Trust in London, told the Wall Street Journal that he expects it will cost “many hundreds of millions of euros.” The building will also need to dry out over a long period of time, he said. “It will be several years to complete a full restoration and I would imagine the works will have to be phased so that there can be public access as soon as possible even though there will be works ongoing,” Aiers added.